by Andy Higgs in Features, Flight report, Home. 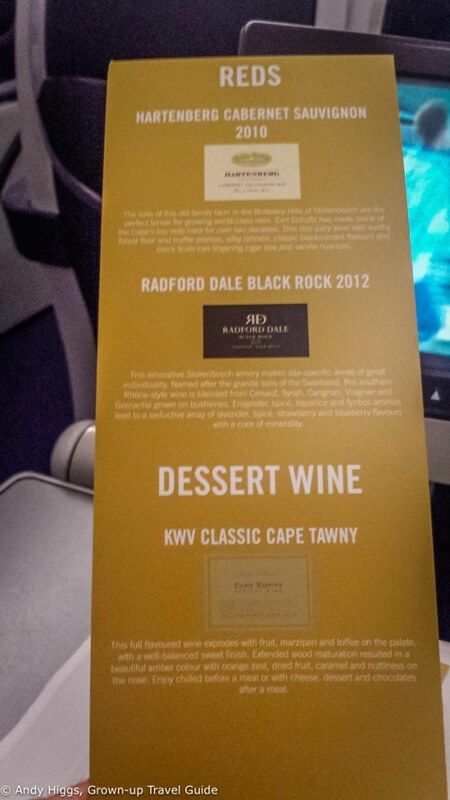 This flight report covers the return leg of the award redemption I used in April to travel to Johannesburg and back. Well, it covers the long-haul part of the journey; the short-haul flights involved were fine but nothing special. Domestic and inter-European business class is not really worth a flight report these days but rest assured if I have a spectacular experience I will let you know. 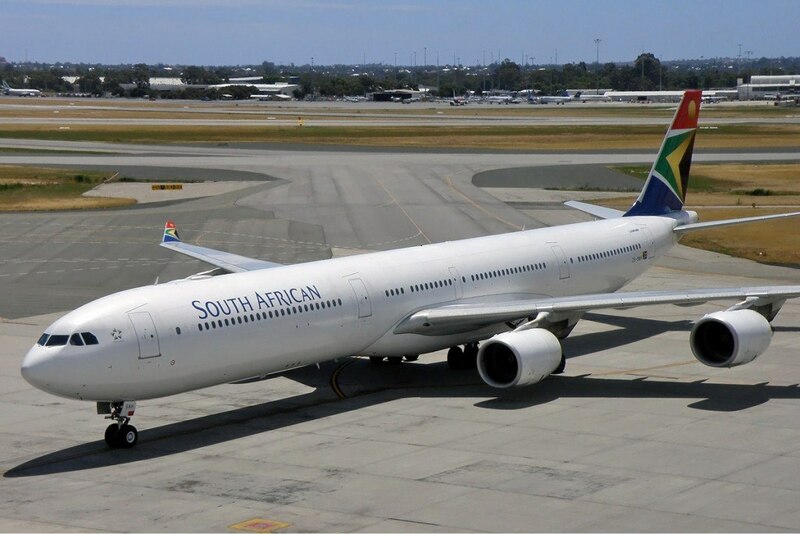 Anyway, my booking involved two different routes and airlines, I flew Lufthansa’s new Business Class on their A380 out of Munich for the southbound but going north South African Airways would be taking me on their A340-600, also in Business Class. 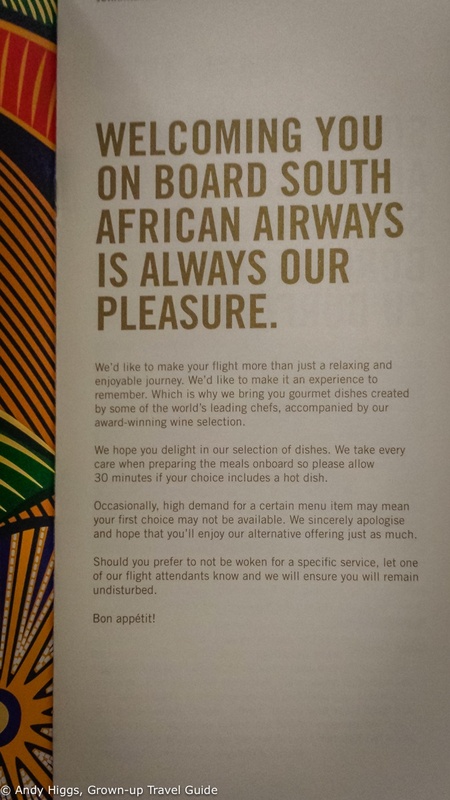 For the record, South African Airways no longer offer First Class. The details of the award redemption, number of miles and cost are all found in that first article so I won’t repeat them here. The flight down had been great and although the SAA cabin is not as modern as its German rival, I was looking forward to my journey. 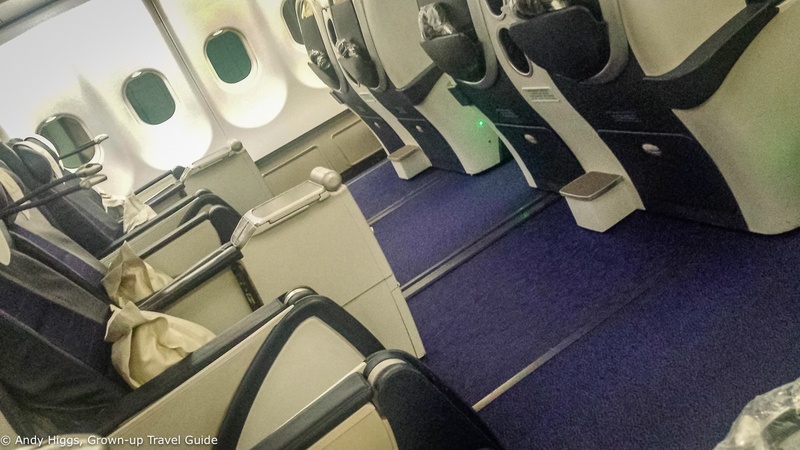 The fact is that I have actually flown South African in Business Class before – last year when returning from my adventure in Zimbabwe Lufthansa decided to have one of its astonishingly regular strikes. Fortunately I was rebooked onto SAA and actually enjoyed the experience more than the outgoing flight – which was in Lufthansa’s old Business Class. I didn’t take any pictures or video at the time so I didn’t write a flight report – something that I would now be able to remedy. 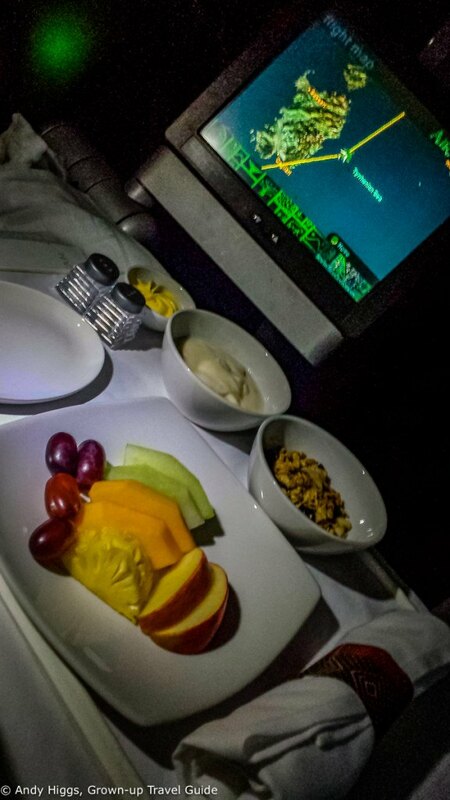 I had loved the food and slept really well – so was hoping the same would apply for this trip. My return journey was relatively straightforward: Johannesburg – Munich – Copenhagen – Trondheim. Flying to Munich rather than Frankfurt adds about 10 minutes to the flight time which is a little less than 11 hours. This is a night flight – as are all direct flights from JNB to Europe as far as I am aware – so obviously it’s a bonus if you can get a few hours sleep. The lack of a time difference is a even bigger one; passengers can get straight back into their usual routine at home after being so far away in Africa without the jet lag issues from flying a similar distance west or east. My total cash outlay for this was around USD 1800. 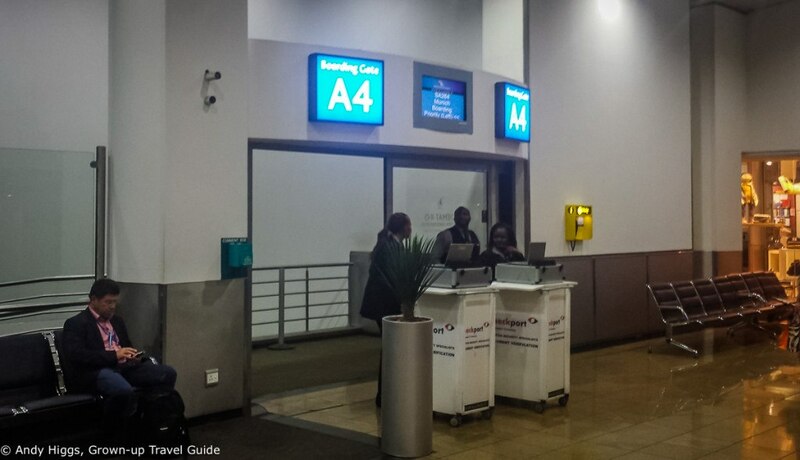 Checking in at OR Tambo airport in JoBurg was a breeze. I was early but there was no queue at any of the Business Class desks and my bags (and drone) were taken care of within a few minutes. Service came with a smile and a laugh – the guy at the desk was clearly having fun and cracked jokes as we chatted about my time in his country. I was given directions to the lounge – which was the reason I had checked in with plenty of time to spare – and proceeded through security. There is no fast track for passengers with premium class tickets but security was a fast and painless affair. 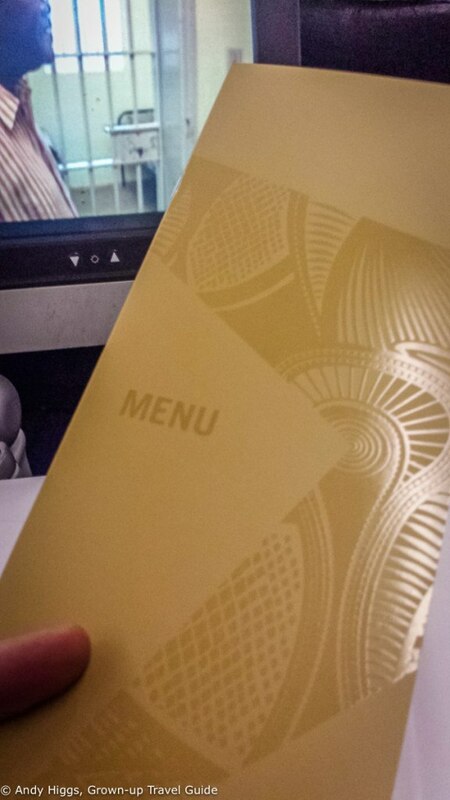 SAA’s Baobab Business Class Lounge at O.R. Tambo International Airport is touted as the airline’s flagship departures lounge. You’ll find it on the Mezzanine floor of the international departures terminal after passport control on the way to the A Gates, reached by escalator, stairs or lift. Just follow the signs and show your boarding pass to gain entry. I really like this place; it’s big, so even when busy I never had a problem finding a seat. There are several buffet areas offering basic snacks and finger food as well as a few slightly more substantial dishes so you won’t have to wait for something to eat either. Rather than the self-service of some lounges this one has a bar with friendly staff. 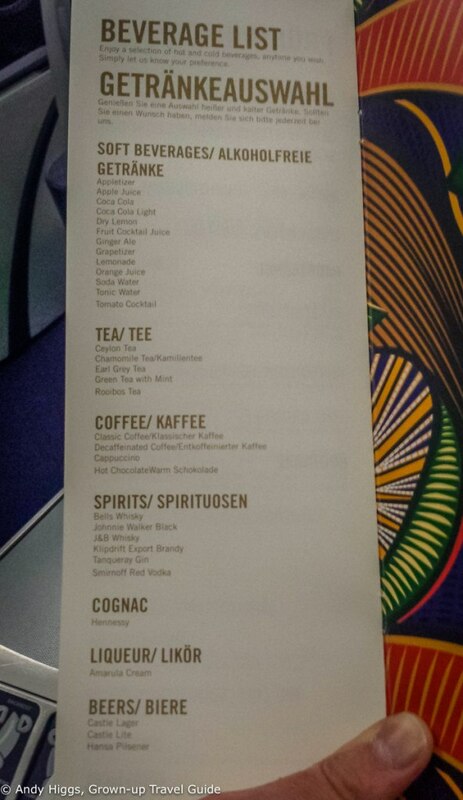 There’s a decent selection of drinks and snacks here too. The whole place is modern, light and spacious with separate areas for relaxing, working and eating. The free wi-fi is fast, there are several TVs and a range of newspapers and magazines. Flight information is also displayed. Best of all, however, are the shower facilities. I took a quick video of both the lounge and the shower room which you can see later in this article. If you have been on the road all day before arriving at the airport follow my advice and bring a change of clothes so you can freshen up before the flight. They provide towels and toiletries so you don’t need to worry about those. I changed into my soft track suit that I keep just for long-haul flights and returned to the lounge for a couple of beers before my flight was ready for boarding. When I reached the gate the flight was boarding and there was no queue at the gate. I think Business Class passengers board first but there is otherwise no separation here. When I checked in earlier there was plenty of space so I chose a window seat near the rear of the Business Class section hoping that I could snag both. I figured that I could move to an aisle seat if necessary as I don’t like being blocked in by the window. I needn’t have worried as the entire row was empty. The seats are a little dated but comfortable enough – although could have been a little wider. As is often the case with older planes, the legroom while seated was good. They convert to fully flat when it’s time to sleep (or try to) but are not really long enough for someone of my height or more to stretch out (I’m about 6 ‘3″) – so clearly the seats are a little closer together than is ideal. I found it better to sleep with the bed at a slight recline rather than flat. 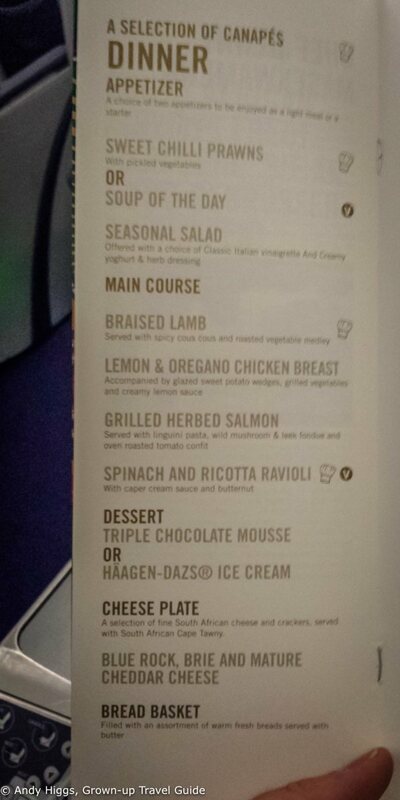 The cabin was the same as the one I had flown in last year – but on that occasion Business Class was completely full as they were taking passengers from the cancelled Lufthansa flight as well. 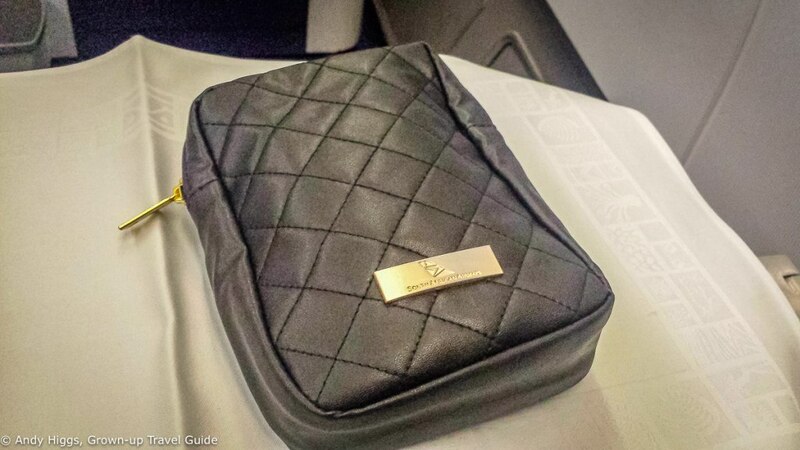 There were no real surprises in the amenity kit despite its rather interesting appearance. It reminded me of an old lady’s purse but contained the usual eye shades, socks, a toothbrush and toothpaste, hand cream, and headphone covers. A pillow and blanket were waiting for me as well and I helped myself to an additional pillow from the empty seat beside me for a little extra comfort. Each seat has its own rather small monitor which pops up from one of the armrests. This is operated with a wired handset and a set of good quality noise-cancelling headphones are also provided. The entertainment system had a good range of movies and TV shows so I found more than enough for the journey, even if I couldn’t sleep. The seats have a power outlet for charging devices and a tray table in the other armrest. I was offered a pre-take-off drink and chose a beer; more for the Beer Diary than anything else. 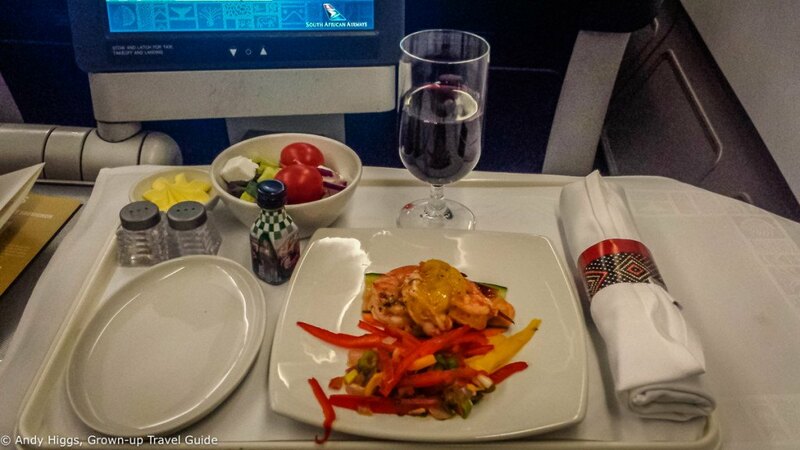 The food was excellent – this is an area in which SAA excels. 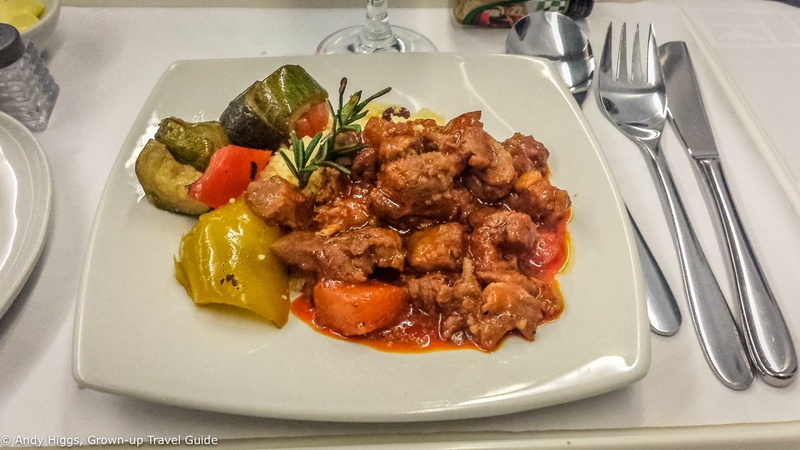 My taxi driver in JoBurg waxed lyrical about the catering on South African and he was not wrong – the meals were some of the best I’ve had up in the sky. I took even more photos this time as I was alone (I am getting better at this part of the process even though I dislike it) but they often came out blurry due to the lighting in the cabin and my refusal to use a flash. 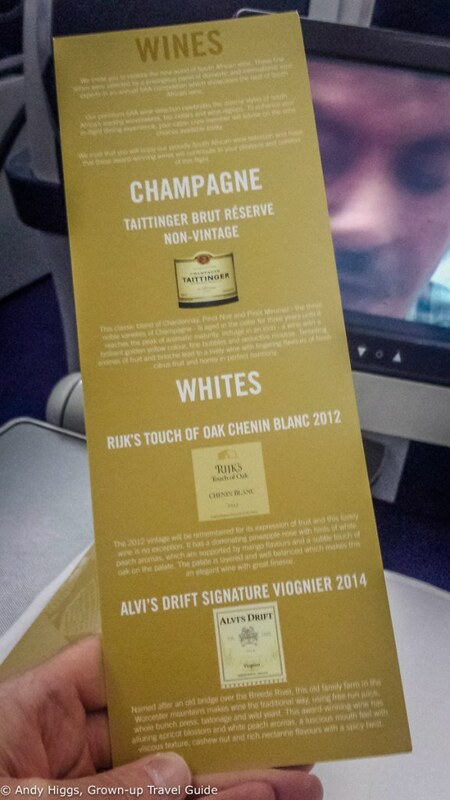 We were handed menus after take-off. Plenty to choose from – and plenty that sounded good. Express breakfast? Nope, not for this guy. The beer selection was a bit lame, but I was on to wine by this point anyway. A little champagne before dinner? Why ever not? Sweet chili prawns? Don’t mind if I do. The braised lamb was tender and perfectly spiced. Breakfast was vert tasty too – and most welcome after sleeping for almost five hours, which is good going for me. Flight 264 took off on time and we had a smooth ride. Service was just right – the crew were attentive and efficient as well as friendly. The holy trinity, you might say. 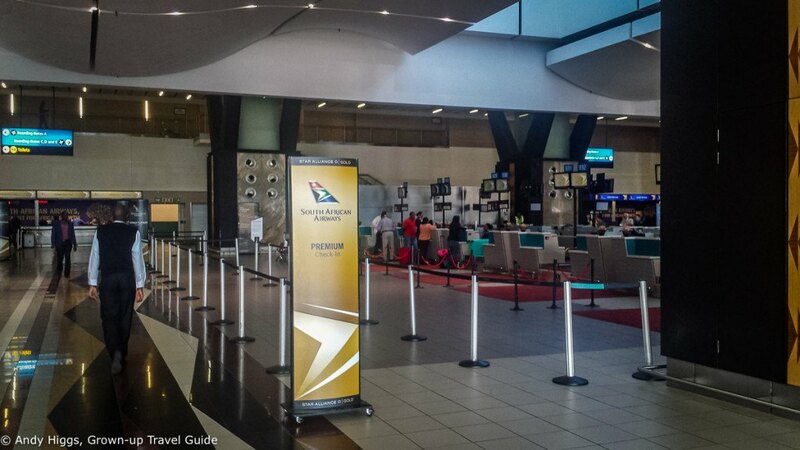 South African Airways has an excellent product and if you can redeem points on Star Alliance you should definitely consider using their services to and from Africa. Lufthansa does beat them in terms of the overall experience but availability for redemptions is far scarcer. Don’t forget you can combine airlines on an award ticket just like I did on this occasion. 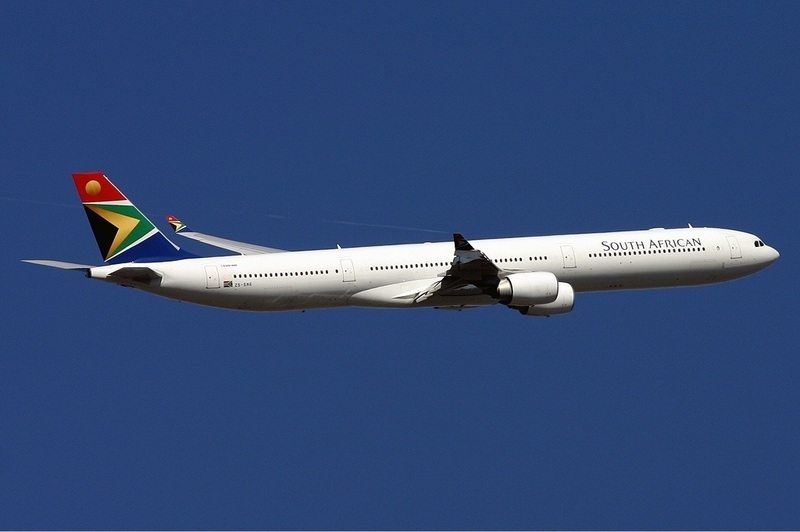 Would I pay for SAA Business Class? No, but then I wouldn’t pay cash for a regular Business Class ticket on any airline. Now and again special offers do appear, but generally I would recommend flying in Economy and keeping the money to have more fun when you arrive. This is especially true when flying to Africa from Europe as jet lag is not an issue so even if you are awake the whole way you can quickly recover. Business Class configuration: 42 seats in 2-2-2 layout.